No matter how intelligent elephants are, they won’t learn not to defecate when performing at the circus. Generations of circus managers and animal trainers have wrestled with the problem, but the elephant sphincter has forced them to bow to the inevitable. The solution they have come up with is to employ clowns walking behind the elephants with scoops, buckets, and brooms. Their job is to divert attention when the inevitable occurs, and make the audience laugh. 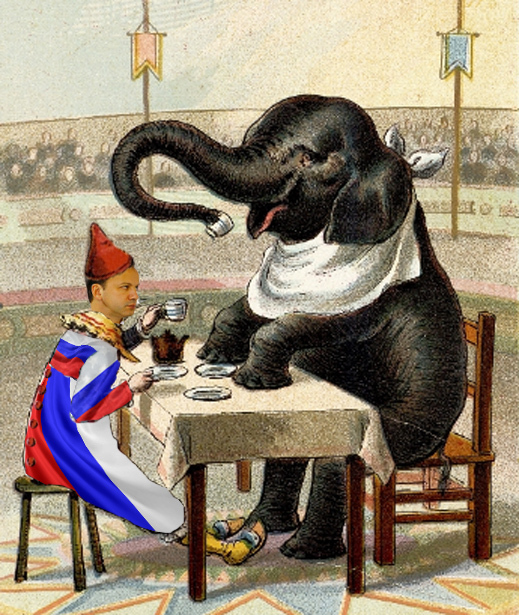 Yury Nikulin, the greatest of Russian clowns and director of the Old Circus in Moscow, once told me that if the clowns he assigned to the elephant’s rear guard failed to get the crowd laughing, they wouldn’t get promoted until it did. Deputy Prime Minister Arkady Dvorkovich (lead image, left) is trying to preserve his job when President Vladimir Putin appoints the new Russian government after the election of March 18. A US-educated chess adept and protégé of Prime Minister Dmitry Medvedev, Dvorkovich is thinking several moves ahead in his game. 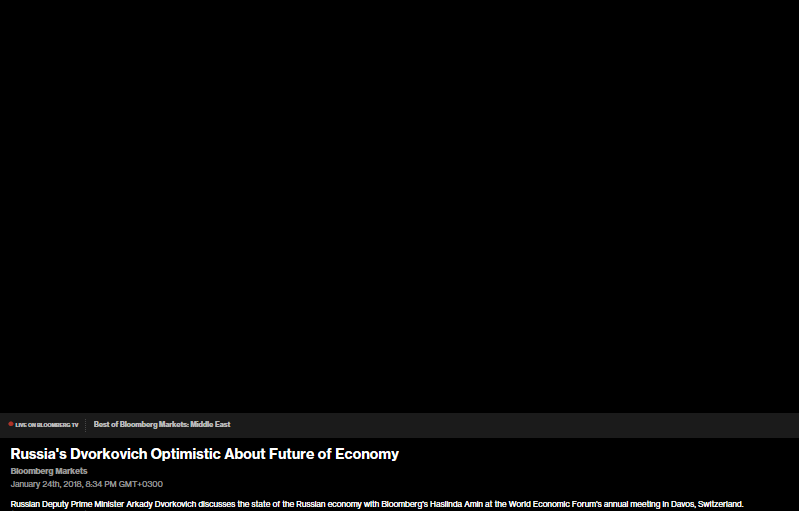 That game, Dvorkovich calculates, must survive the possible replacement of Medvedev as prime minister. So when Dvorkovich said in Davos there are no oligarchs in Russia, only “good businessmen”, he wasn’t trying to make the Russian audience laugh. He was trying to save his job — with support from oligarchs who haven’t backed him before. “I don’t think we have the oligarchs”, the Russian press reported Dvorkovich as telling a Bloomberg television interviewer. “It was a concept of the 1990s… Now we have only good businessmen, socially responsible people who care about the country and earn money running responsible business.” Another version of what Dvorkovich said appeared on this website specializing in oligarchs and crime. Dvorkovich has never been invited to the Kremlin’s oligarch dinner in December to sit beside Putin and his ministerial juniors, Finance Minister Anton Siluanov, Economic Development Minister Maxim Oreshkin, and Industry Minister Denis Manturov. However, the two oligarchs Dvorkovich has been personally closest to, Ziyavudin Magomedov and Suleiman Kerimov, have been regulars at the dinner; that is, until Kerimov was arrested and jailed in France last November. Dvorkovich’s association with Kerimov was noticeable when Dvorkovich’s wife, Zumrud Rustamova, was being paid by Kerimov to sit on several of his company boards, including Kerimov’s secretive asset holding in Moscow, Nafta Moskva. She is also being paid by the steel oligarch Victor Rashnikov to sit on the board of his company, Magnitogorsk Iron and Steel Works (MMK). Dvorkovich’s closeness to Magomedov started in their university student days. For their business ties since, read this. In 2015, when Magomedov needed Dvorkovich’s help to fight off Rosneft chief executive Igor Sechin in a multi-billion dollar contest over Russia’s offshore oil trade flows, Dvorkovich proved to be impotent. If Medvedev is removed, and Sechin takes his place as Putin’s preferred presidential candidate, Dvorkovich must find fresh oligarch supporters. The factional lineup for succession to the prime ministry and to the presidency is currently between officials and oligarchs advocating capitulation to the US (CUS), and those in favour of resistance to the US (RUS). The CUS capitulationists include Alexei Kudrin, whom Medvedev sacked in 2011 for trying to replace him with Washington’s backing. Also in the CUS faction are German Gref; Anatoly Chubais; Mikhail Abyzov; and inside the Kremlin, Dmitry Peskov. The RUS faction includes Deputy Prime Minister Dmitry Rogozin; Defense Minister Sergei Shoigu; former chief of the Kremlin staff Sergei Ivanov; Security Council Secretary Nikolai Patrushev; and Foreign Minister Sergei Lavrov. 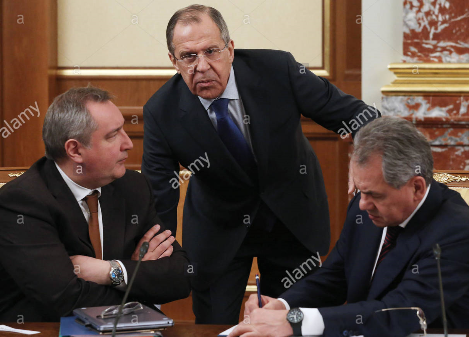 Left to right: Dmitry Rogozin; Sergei Lavrov; Sergei Shoigu. Reported Moscow speculation that Peskov wants Putin to move him into Lavrov’s place signals, not only that Peskov thinks he needs a future for himself after Putin leaves office, but also that he hopes he can make up for the failure of his billion-dollar American information schemes – RT and the Oliver Stone films – with the kind of promotion Putin awards high-level failures. Patriarch Kirill, on whom the President relies for advice on such matters, has expressed himself in favour of two conditions – the new prime minister must be a baptized Christian (Kudrin, нет; Shoigu, да), and that CUS is preferable so long as Putin can make it appear to be RUS, and vice versa. Also, Kirill has a problem with the oligarchs who were closest to him – Sergei Pugachev of Mezhprombank stole more than a billion dollars from the Central Bank of Russia and is on the run in France; Dmitry Ananiev of Promsvyazbank has stolen even more, and also done a runner. For Kirill’s banking troubles, read this. The one oligarch on whom the Patriarch and the Church Synod depend now for the rescue of their Peresvet bank turns out to be Sechin. The Rosneft investment in rehabilitation of the Church’s bank exceeds more than a billion dollars. Between the CUS and RUS factions, Sechin is as uncompromising a succession candidate as Kudrin, which is why Medvedev may survive for another term. 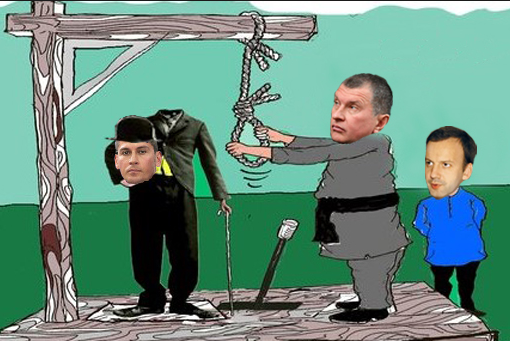 Sechin has other disadvantages. Despite his long established power in the Kremlin, Sechin’s name has never been tested in national opinion surveys of the politicians whom Russian voters recognize and trust. By contrast, Shoigu and Lavrov rate far ahead of Medvedev, while Rogozin and Kirill are neck and neck. Sechin’s biggest electoral liability is his unusual face (pictured below), which rarely manages a smile.